James Stoffo has been involved with wireless audio for is entire professional career. Starting out as a Radio Surveilance Technician in the US Navy Submarine Service, he went on to work in technical support for Vega Wireless Systems. 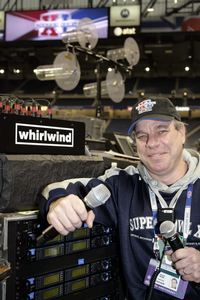 James founded Professional Wireless Systems and went on to work as the wireless microphone operator for forteen consecutive Super Bowls, multiple Grammy and Latin Grammys, Billboard, Latin and Mexican Billboard, Country Music Award shows and RF Coordinator for multiple NBA All Stars and Rose Bowl games. His new company is Radio Active Designs, innovators in wireless audio technology.